Neglected by her husband, an ambitious lawyer, Irene seeks variety in Berlin's nightlife, drugs and flirtations included. A scientist is tormented by an irrational fear of knives and the irresistible compulsion to murder his wife. 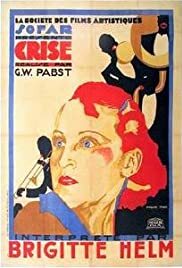 "Abwege", a film directed by Herr G. W. Pabst, demonstrates the most representative and important artistic merits of the oeuvre of this great German director during his silent period. Expressionism and Psychology are both intertwined without distinction in this film so we could say that the film is an Expressionistic film as well as a profound study of the psychology of the main characters, or a film about a marriage in crisis in which the troubled relationship of the couple is worked out in an oppressive setting. In its visual aspects, "Abwege" is an astounding film with important and decisive cinematography by Herr Theodor Sparkuhl. The different settings that are showed in the film superbly illustrate the different moods suffered by its main characters. This is demonstrated in an astonishing early scene when Herr Thomas Beck ( Herr Gustav Diessl, perfect as the boring and upset husband ) is depressed, sitting on the sofa the in their bedroom in front of an open window waiting in vain for his wife, Dame Irene ( Dame Brigitte Helm, more feline and cold than ever ) The different way of lighting the apartments of the various characters or those wonderful and thrilling shadows in the stairs, are a good examples of the virtuosity of Herr Theodor. Complicated, controversial and at the same time, successful, is the psychological study of the different personalities of that marriage, a couple in crisis characterized by continuous ups and downs, incomprehension, monotony, and lack of understanding. They are two very different people with different ways of living and they must take on the hard task of finding common ground, an effort that seems to doomed to fail. Herr Pabst falters at the end of the film when he resorts to an unconvincing happy ending as well as doing some unnecessary moralizing. can you imagine, this film gives the chance to watch a genuine, decadent German night-Klub of the Weimar era!!!... It's is a great present for decadent Teutonic aristocrats who in this way can remember the crazy nights of their youth, where many good times were spent in such gorgeous dens of iniquity. There the vicious and idle clients could find the vice of their choice: alcohol, drugs, tobacco and, the most terrible of all, Latin dancers! And now, if you'll allow me, I must temporarily take my leave because this German Count must return urgently to the Klub.